- Every year around September 11th, all 48 - 4,000 footers in New Hampshire have a United States flag flying from its summit between the hours of 12 p.m. and 2 p.m. in remembrance to those who lost their lives on September 11th. 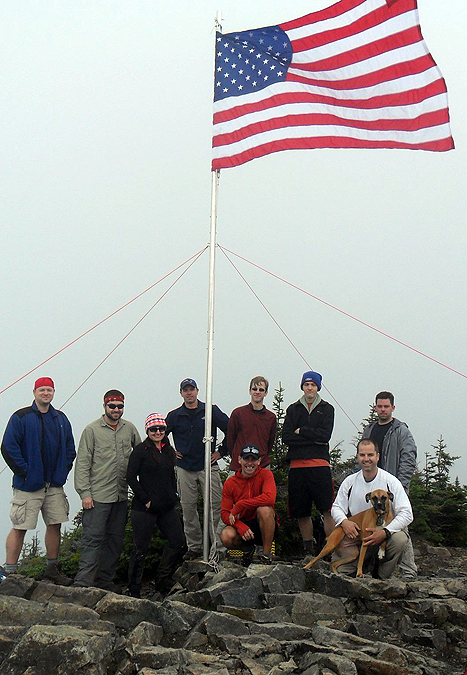 I have been lucky enough to hike and see the flag fly from Mount Jefferson on a beautiful late summer day in 2010. It was a pretty great site and always wanted to help out. Last week while hiking, my friend Whitney told me she was joining the Hike-NH group for Flags of the 48 on Flume Mountain and invited me to join. I was pumped and jumped at the opportunity to tag along. - There were 11 of us all together, Beckie, Prima, Ian and his dog Marlie, Derick, Matt, Michael (Petch), Whitney, Peter, Kris, and Spencer. - Matt brought along the flag pole which he cut up in three foot sections. We took about thirty feet length all together and attached a piece to all of our packs. The poles were very light weight and other then brushing against a branch here and there you really had no idea they were on your pack. - We made good time up to the summit of Flume and set up the flag early. The guys did a great job of putting together and tying down the pole and hoisting the flag. It wasn't too windy but windy enough for the 8X5 flag to fly in the wind most of the time but it was nice enough to linger around on the summit without getting too cold. Lots of hikers came by and stopped and enjoyed the site of the flag flying. Unfortunately, the sun didn't come out so there were no views but still it was a great time on the summit and everyone was having a great time and enjoying each others company. - Some of us in the group took a side trip over to Mount Liberty to check out that flag. 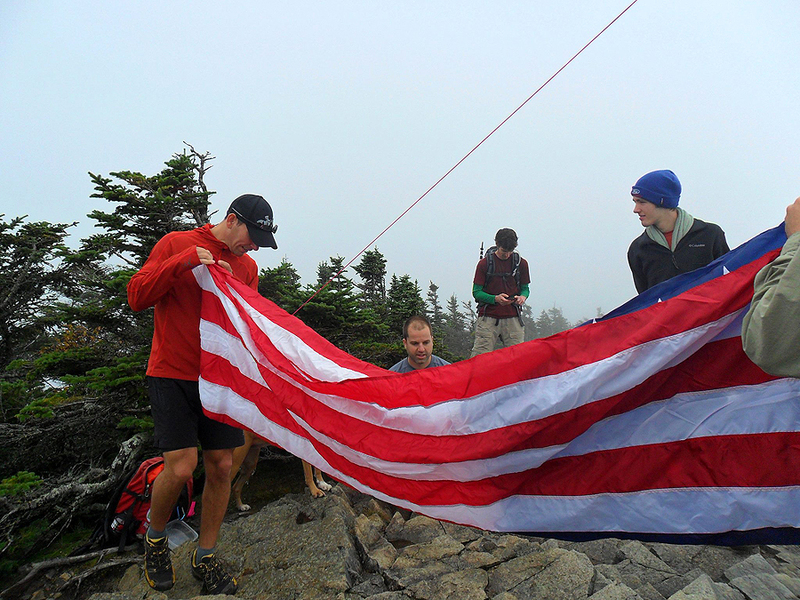 Mount Liberty's flag was hoisted up by a group of Boy Scouts. They used PVC pipe and it looked a little bent but was holding strong and flying well. There were no views to be had from Mount Liberty either and compared to Flume it was freezing! The summit is a little more exposed and the wind was more present and it was drizzling making for a short stay on the summit before we headed back down and up to Flume. - It was a great hike up, a fun time flying the flag, and a nice relaxing tailgate following the hike filled with lots of laughs. - We ate a whole bunch of food and waited for Beckie and Prima to make their way out of the woods. They headed up Liberty after us so they were running behind us. However, after being at the parking lot for almost two hours they still had not shown up so the group went back out down the Lincoln Woods Trail to make sure they were ok. About a mile down the Lincoln Woods Trail they were hiking out, they were fine just got a little bit slowed down coming back to Flume from Liberty but were able to hike out just as it got really dark out. Beckie had home made cookies in her car which hit the spot just before I took off for the ride back to RI. - It was a really great day out and I was happy to have taken part in Flags on the 48. Flags on the 48 - Flume Mountain! Nice photos and report Chris, glad you could join us. It was great to meet and hike with you. Kris, It was great to meet you and you took some really good pics. I'll keep an eye out for you on the trails and look for your reports on Hike-NH! Chris, Good for you guys, nice flag set up. i told myself i would try to join a team ths year but waited too long. I'm putting a remider up for next year. Definitely do it next year! It is a lot of fun and everyone was really nice to hike with and get to know. Chris, great to finally meet you, glad you could join. Not the best weather, but a terrific cause and a great group to boot. See you on the trails! I can't take credit for most of it, but thanks anyway! I brought the pole, but Kris brought the flag, others brought all the delicious food, and Derek helped with a lot of the organizing. A true team effort all around.